.odin ransomware uses sophisticated techniques to infiltrate computers and hide from its victims. Use Reimage to determine whether your system is infected and prevent the loss of your files. 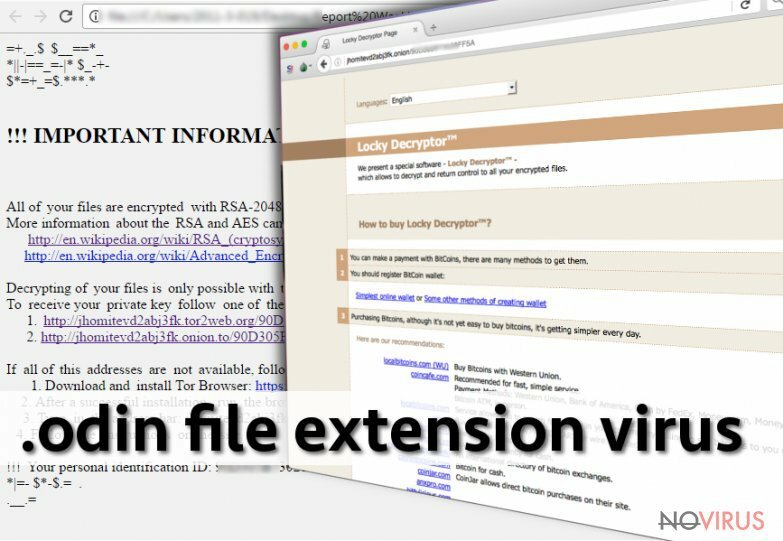 .odin file extension virus is also known as ODIN ransomware is a file-encrypting virus, which corrupts more than 390 types of different files. There’s no chance that some of your important Word or PDF documents might survive ransomware attack. Unfortunately, virus researchers haven’t managed to create a free decryption tool yet. Now hackers might seem like Gods who can give victims a mercy and decrypt corrupted files. However, for decryption key they ask to pay some Bitcoins. Here we would like to add that hackers offer to use Locky Decryptor, and that means that virus is a new version of the popular Locky ransomware. But you should not think about paying the ransom and sponsoring crooks. The first thing you have to do is to remove .odin file extension virus from your PC using a strong anti-malware program such as Reimage. When you wipe out malware from the computer, you can think about restoring lost data. For example, if you have backup copies, you will be able to do it easily. In the ransom note, cyber criminals explain about data encryption and explain possibility to decrypt them. Probably, you have already understood that the only way to get back access to the files is to pay the ransom. Hackers provide to each victim unique ID and link to the payment website. How much do they ask for decryption tool? 0.7 Bitcoins (around 370 GBP). Is it worth paying? Not at all. Hackers might disappear after receiving payment, and you will face even bigger loss. However, they might provide a decryptor. The problem is that with this tool or encrypted files you might also get more computer infections. For this reason, you should concentrate on .odin file extension removal. We already mentioned that .odin file extension virus spreads via malicious email campaigns. The virus travels as DLL file and is executed as soon as it gets inside the system. Unfortunately, hackers became excellent in creating persuasive emails and encouraging users to open the attachment. They name the malicious file as innocent and important documents, such as receipt or invoice. It’s hard to imagine that developers will send simple DLL file and expect victims to open it. Obviously, it’s a virus! However, nowadays Internet users cannot trust even Word or PDF files, because they might include infection. The only way to protect your PC from ransomware is to be careful with emails. Stay away from spam and do not open any attached files from unknown senders. Besides, you should not visit high-risk websites, click on suspicious ads or download questionable software, because all these actions might lead to ransomware attack. Unfortunately, ransomware-type viruses are hard to remove, but you should concentrate on the positive side – it is possible! For .odin file extension removal, you need to employ strong anti-malware software. We recommend choosing one from these programs: Reimage, Malwarebytes MalwarebytesCombo Cleaner or Plumbytes Anti-MalwareMalwarebytes Malwarebytes. Of course, you can use any other professional and reputable security program. However, malware can block anti-malware programs or prevent from installing it. If it happens, you have to reboot your computer to Safe Mode with Networking and follow instructions how to remove .odin file extension at the end of the article. After virus elimination, have a look at additional data recovery methods bellow. Sign in to your account and launch any Internet browser. Download a legitimate anti-malware software, for instance, Reimage. Make sure you update it to the latest version and then run a full system scan with it to detect and eliminate all malicious components of the ransomware to remove .odin completely. In a new window that shows up, click the Next button and choose a restore point that was created before the infiltration of .odin and then click on the Next button again. After restoring the computer system to an antecedent date, install and check your computer with Reimage to uncover any remains of .odin. Using the tutorial provided above you should be able to eliminate .odin from the infected device. novirus.uk team has also prepared an in-depth data recovery guide which you will also find above. Data Recovery Pro is not the official Odin decryption tool, it can help to recover lost files quickly. Although we cannot guarantee that it can decrypt .odin files, we believe that it is worth a try. Data Recovery Pro is not the official Odin decryption tool, but it can help to recover decrypted files. However, there’s no guarantee that it will definitely encrypt locked files, but you have nothing to lose! Give this tool a try. Do not use Locky Decryptor! Even though hackers promise that this tool decrypts all the files, do not consider paying the ransom and using this tool! Using Locky Decryptor might cause more problems in the future. With decrypted data, you might get other malware or viruses. It is strongly recommended to take precautions and secure your computer from malware attacks. To protect your PC from .odin and other dangerous viruses, you should install and keep a powerful malware removal tool, for instance, Reimage, Malwarebytes MalwarebytesCombo Cleaner or Plumbytes Anti-MalwareMalwarebytes Malwarebytes. This post was published on 2016-10-12 at 15:33. Category: Ransomware, Viruses. You can quickly scan the QR code with your mobile device and have .odin file extension virus manual removal instructions right in your pocket. What method did you use to remove .odin virus?